The Japanese attack force—which included six aircraft carriers and 420 planes—sailed from Hitokappu Bay in the Kurile Islands, on a 3,500 mile voyage to a staging area 230 miles off the Hawaiian island of Oahu. According to Twomey, the Japanese sailed without radar or reconnaissance planes overhead, in an effort to avoid detection. 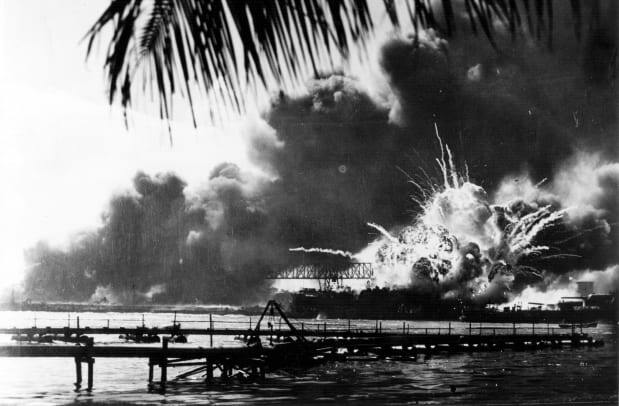 U.S. officials overlooked Japanese forces’ preparations for war, and missed warning signs of the impending attack, including an intercepted December 6 Japanese message asking about berthing positions at Pearl Harbor, and a radar sighting of a large group of airplanes headed toward Oahu on the morning of December 7. The first wave of the attack included 180 Japanese aircraft, including torpedo planes, high-level bombers, dive bombers and fighters. They were followed by a second wave of similar size, but with more dive bombers and no torpedo planes. Japanese forces started the attack shortly before 8 a.m. Hawaiian time, when the initial wave of fighters struck, according to U.S. Naval History and Heritage Command. 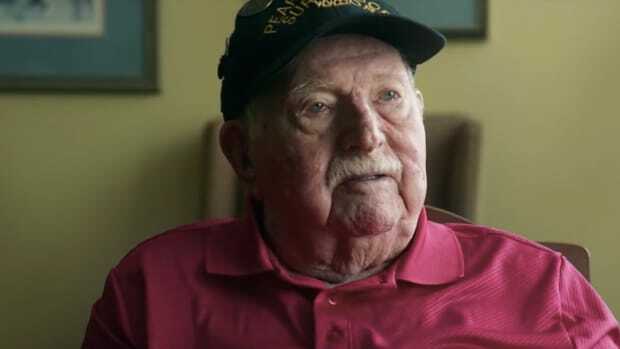 According to a 2016 article by retired U.S. Navy Commander Alan D. Zimm, Japanese Captain Mitsuo Fuchida, who led the aerial attack on Pearl Harbor, made a critical mistake by firing two flares, which signaled to his aviators that they had not caught the Americans by surprise. As a result, they used more cautious tactics and inflicted far less damage than they might have. The Japanese attack lasted nearly two hours. 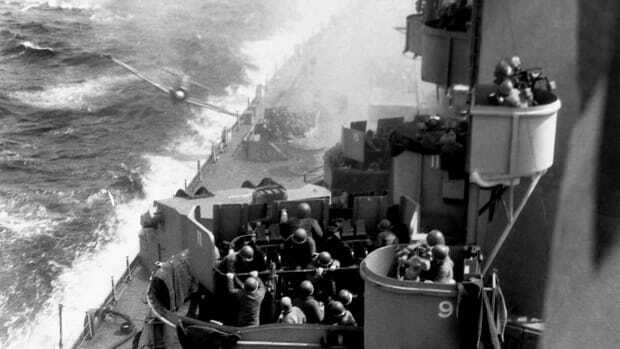 Japanese torpedo bombers flew just 50 feet above the water as they fired at the U.S. ships in the harbor, while other planes strafed the decks with bullets and dropped bombs. The U.S.S. Arizona, which was moored next to a repair ship when the attack began, was struck by several Japanese bombs and exploded in flames as it sank. More than 1,100 service members were killed, including Rear Admiral Isaac C. Kidd and the ship’s commanding officer, Captain Franklin Van Valkenburgh. Though caught off guard, U.S. service members fought back hard, and managed to fire more than 284,000 rounds of ammunition at the Japanese attackers. One of the most outstanding heroes was Cook Third Class Doris “Dorie” Miller, who took over a 50-caliber Browning anti-aircraft machine gun on the U.S.S. 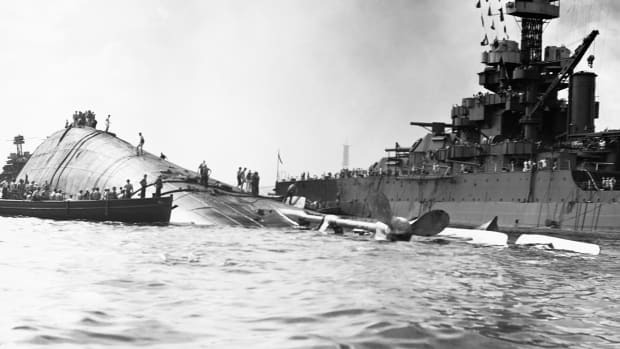 West Virginia, and despite his inexperience with the weapon, managed to shoot down between four and six Japanese planes before being ordered to abandon ship. He later became the first African-American to receive the Navy Cross. Miller was killed in action in 1943. The attack killed 2,403 service members and wounded 1,178 more, and sank or destroyed six U.S. ships,. They also destroyed 169 U.S. Navy and Army Air Corps planes. The Japanese losses included 29 aircraft, in addition to five midget submarines, and 129 attackers were killed and one taken prisoner. 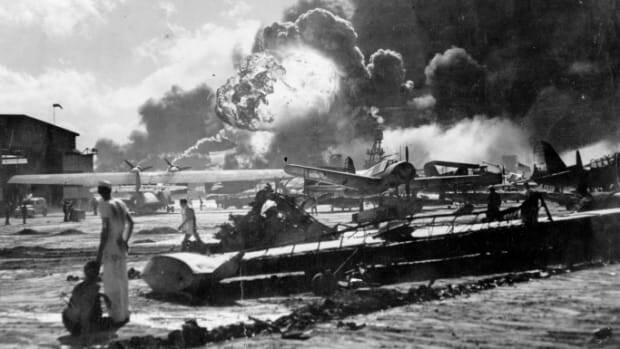 The Japanese opted not to launch a third wave of aircraft against Pearl Harbor, and instead turned around and headed back across the ocean, in part because their fuel was running low. 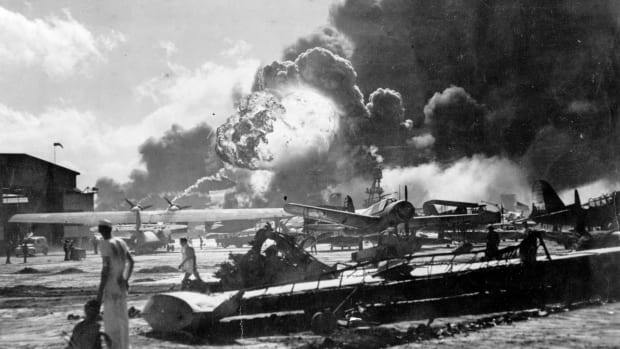 The attack on Pearl Harbor was followed the next day by Japanese air attacks on U.S. bases in the Philippines, Guam and Wake Island. Despite inflicting heavy casualties, the Japanese attackers failed to achieve their objective of disabling the U.S. fleet. No U.S. aircraft carriers were at Pearl Harbor that day, and the Japanese were unable to destroy vital infrastructure such as repair shops and fuel tanks. In Washington, President Franklin D. Roosevelt learned of the attack during lunch, when he received a phone call from Secretary of the Navy Frank Knox. Yamamoto, the architect of the attack, didn’t survive to see Japan’s eventual defeat. He was killed in 1943, when American fighters shot down his plane over the Solomon Islands.